There’s nothing like looking after your kids when they’re feeling sick. As much as it pains me to see my kids suffer from an awful stomach flu, being needed for lots of cuddle time and one-on-one comforting has to be the most rewarding things any parent could feel. It comes with the territory, while some days your kids will want nothing to do with you as they attempt to establish some sort of autonomy from mom, dad or both (sad, I know). Other days, they’ll find themselves needing no one else in the world besides their parent, and as parents, you’ll want nothing more than the safety, health and happiness of your child to be at 100 percent. Almost immediately my focus shifts and before I know it I’ve forgotten to shower, eat a decent meal at a reasonable hour and somehow my baggy clothes have managed to take over my wardrobe. With all four kids being sick from the flu, my priorities meant doing whatever needed to be done to get them back to a healthy state. This meant regular check-ups with the doctor, resting periods together and getting the kids’ appetites going. Survival mode means doing whatever it takes to get things back into our normal groove. Without intentionally putting things on the back burner, I have a tendency to neglect everything else, (especially myself) the moment I try to gain control of a situation involving our kids. It was only until I had time to decompress, between waves of kids being sick, did I realize how stressed I really was. Mike had taken over looking after the kids while I set out for a long-awaited manicure appointment. Although I wasn’t aware of it at the time, as I began to relax, my body recognized the huge contrast in experiencing overexertion and feeling a lot less tense. As the waves of stomach flu continued through all four kids, (man, we have a lot of children), I felt myself becoming drained again and again. Over and over I pressed the reset button, either by sneaking in a quick workout really early in the morning, or nearing the end of the illness, getting a much-needed massage. I had to make a conscious effort to do both simultaneously, take care of our our kids and take care of myself. Getting things done one after the other just isn’t an option. 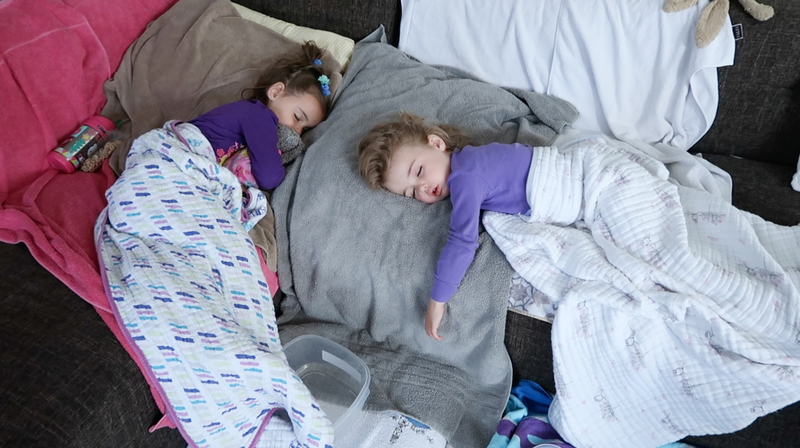 Watch as our weeks of illness unfolded in our home.